Three cheers for corn in this triple-corn taco! 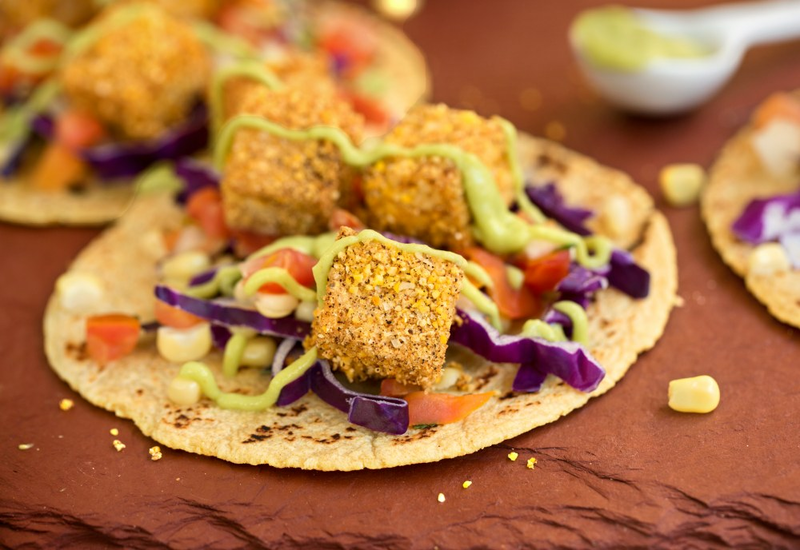 The humble grain does overtime in this vegan, gluten-free dish: soft corn tortillas are piled high with fresh corn kernels, and crowned with crispy cornmeal-coated tofu. Crunchy cabbage slaw and homemade pico de gallo provide texture and flavor contrast. The tacos are then drizzled with a delicious avocado crema—but unlike traditional crema, this one relies solely on the avocado for its creamy texture, resulting in a dairy-free sauce that you'll want to put on everything. Best of all? It's all ready in 20 minutes. Feel free to vary the cabbage and pico de gallo based on what’s in-season and in your fridge. Just keep it simple to allow all that golden corn goodness to shine. The tofu is best served just after it's fried, but if you have leftovers, serve on top of salad for a crunchy crouton alternative. Per Serving: 360 calories; 16g fat; 50.4g carbohydrates; 10g protein; 0mg cholesterol; 611mg sodium. These crunchy, cornmeal crusted tofu tacos were surprisingly delicious! I'm not a vegan, but made this for me and my fiancee for "meatless Monday" and loved it. The avocado crema sauce was also really delicious. The sauce was so simple to make, and didn't require cashews. We will definitely make this again. These cornmeal tofu tacos are perfectly crispy and delicious. I try to stay away from fried foods, but these are my weakness. Keeping it simple is definitely the key to this recipe. Ito allow all that golden corn goodness to shine. I usually put a bunch of toppings on my tacos, but all you really need is pico and/or cabbage. Honestly I just used pico and thought it was great. Love the crispy coated cornmeal, really delicious. I just used garlic powder and onion powder. I also added cilantro to the avocado crema. Never thought I'd say this, but I actually found a fried tofu recipe I like. I used shredded green cabbage instead of purple cabbage and it worked great. Also made my wife's homemade pico de gallo. The avocado crema made a huge difference, it's definitely the best part of the recipe. Otherwise, it would be dry.